Today, Cooler Master launched their new low profile all-in-one liquid CPU cooler, the MasterLiquid Maker 92. This new CPU cooler is a combination of air cooling and liquid cooling concepts while keeping the unit compact and versatile. Cooler Master combined the radiator and pump into one module which can be swiveled vertically or horizontally. The two different orientations offer different performance and benefits for the system particularly when it comes to air flow. The size and dimension is also very unique. The MasterLiquid Maker 92 has dimensions very similar to a typical tower air cooler. The vertical mounting orientation maximizes space-saving making the cooler only 3.2-inches in width while providing air flow through the components. The horizontal mounting orientation makes the MasterLiquid Maker 92 shorter at 4.7-inches tall. This will also create a downward air flow, blasting air to the motherboard and surrounding components. The cooler orientation options makes it perfect for small form factor PCs. Fit it from ITX to E-ATX motherboards with ease. This versatile all-in-one liquid CPU cooler aims to address your system's clearance issues be it the memory, PCIe slot or CPU cooler clearance on your casing. Such flexible functionality is something uncommon today to both air cooling and liquid cooling solutions. 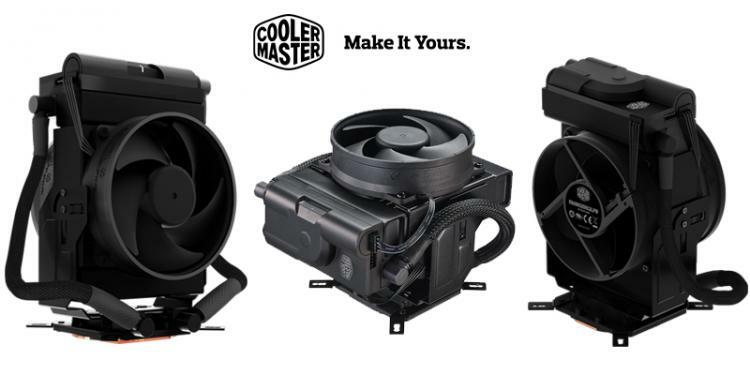 The Cooler Master MasterLiquid Maker 92 will be available this September 2016. To pre-order and see more details, see Cooler Master's website.